The Galapagos Archipelago is a group of 13 major islands and 100 islets and rocks some 1000 km west of mainland Ecuador, in the Pacific Ocean. The water is cold: you will need a 5-7 mm wetsuit with hood and gloves, or a drysuit. The best time to see whale sharks is from May to November, especially in the northern islands like Wolf and Darwin. You can see Hammerheads all year round. Situated at the crossroads of three ocean currents, cold water upwellings contribute to the diversity in the marine environment. Cold water arrives from the southeast via the Peru current and from the west the subsurface equatorial undercurrent (SEC) also brings cold water from the deep. From the northeast, the Panama Current brings warm water. This results in a wide range of marine ecosystems and populations, that includes from tropical species like corals and reef sharks to temperate and sub-Antarctic species like the Galapagos fur seal (Arctocephalus galapagoensis). The Galapagos islands and surrounding marine reserve were the first marine Heritage Site designated by UNESCO. The recompression chamber in the Galapagos is Puerto Ayora on the island of Santa Cruz. Puerto Ayora is the largest town in the Galapagos. See Issue 90 of SCUBA News for an article on diving and travel in Ecuador and the Galapagos. "How can Galapagos not be in the top 10??? (http://www.scubaravel.co.uk/topdives.html) I think many of the sites you mention are wonderful...but Galapagos definitely beats many of them :)"
Darwin Island is what remains of an extinct volcano. 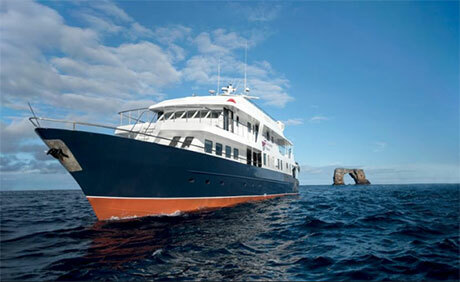 It is 160 km northwest of the main Galapagos islands: reached by liveaboard. An upwelling of nutrient-rich cold water makes for a plethora of sharks, rays, turtles and other large, pelagic, species. One kilometre from Darwin Island is Darwin Arch, which you can see above the surface. Darwin and Wolf islands experience a warm season from January to June and a cool season from July to December. Animals like hammerhead sharks frequently move between the islands, which are 40 km apart, during the cold season. 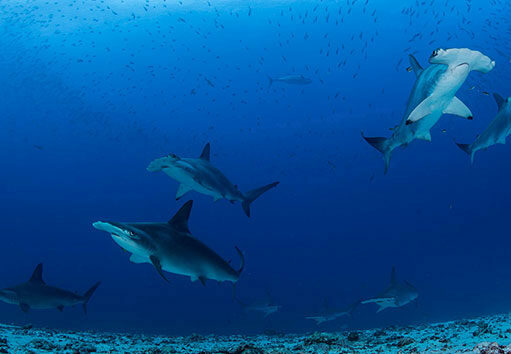 In a recent study scientists from the Charles Darwin Research Station (CDRS) and the National Geographic Society revealed that Darwin and Wolf islands are home to the largest shark biomass on the planet. See liveaboards below. Photo by Enric Sala/National Geographic. A group of hammerhead sharks swims over the sandy seafloor populated with garden eels at Darwin Island. These sharks are known for their ability to make sudden and sharp turns as the unique wide-set placement of their eyes allows them a vertical 360-degree view, which is ideal for stalking their prey. The diving at Wolf and Darwin islands is fantastic - but you need to be an experienced diver. Currents can be strong and the swell significant. Even in the warm season water temperatures might still be as low as 21 oC (although they could be up at 27 oC). Take a hood and gloves. "Strong currents. Whale sharks, schools of hammerheads, Galapagos sharks, eagle rays. " "Cold but ALL is there in squadrons—Scalloped hammerheads, Huge Whale Sharks/Mobula/Eagle rays/dolphins/sea lions/seals/Mola Mola, Penquins all nearby... "
"Whale sharks the size of tractor trailers." "The most amazing sea life encountered with whale sharks, huge schools of hammerheads, galapagos sharks, silk sharks, turtles etc." "20 whalesharks in 2 days, 1000's hammerheads, orcas, turtles what more can i say ....."
"We saw a whaleshark, we went in november BIGGEST AMAZING EXPIRIENCE I HAD IN MY LIFE"
"Visibility over 24 m (80 ft). Moderate currents. Hammerheads, Galapagos blacktip, pod of dolphins, eagle rays and creoles. Several curious sharks came with in a meter of my camera. Prolific fish population. The week before six whale sharks were seen at this site." "There is so many to see, that it's overwelming. Don't go there for the coral. This is THE place for the big pelagics. We saw several schools with more than 100 hammerheads, lots of beautiful galapagos sharks, tuna, barracuda's, turtles, eagle rays, lots more and nine whale sharks in two days of diving. It's like a dream! " "Isolated island in Pacific, rocky wall. Hundreds hammerheads plus whale shark, many eagle rays, golden cowray, mobula, galapogos shark, oceanic whitetip, silky shark etc etc." "Truly amazing, dropping down to 24 metres through a school over some 500-600 hammerheads tonns of Galapagos Sharks, and on our ascent, more than 1000 dolphins, that found us just as interesting as we found them..... the Dive of an hour turned into another 2 hours of snorkelling." "So may dolphins, hammerheads, eagle rays.... so little time." "sharks everywhere, I can't imagine anything being better than this"
"I call this dive the amphitheater. Visibility over 80 ft (25 m). Fantastic dive. Strong currents. 4-6ft swells with consistent surge. We dropped to rocks and held on tight to watch the show. Hundreds of hammerheads, black tip, white tip, silky and Galapagos sharks. Large schools of eagle rays floating in the currents. Huge morays were abundant through out the rocky structure. Saw 5 green turtles. " "Great all round dive sites on the north side for both beginners and advanced divers"
"Sharks, turtles, eagle rays, sealions. All in abundance. Strong current." "Schooling hammerheads, blacktip and white tip reef sharks, turtles, devil ray schools, huge fish, sea lions what more could you want?" "Excellent site, I've been diving for 20 yrs and my 'best dive ever' was here!" "Drop down to 110 feet on white sand bottom and enjoy 20+ hammerhead sharks 10-20 feet long, awesome!!!" "Millions of tropical fish, endemic species, schools of eagle rays (golden and spotted) and most of all HUGE SCHOOLS OF HAMMER HEADS!!!" "A huge rock, depth aprox. 30m. plenty with rays, turtles and always huge schools with hammerhead sharks." "Tonnes to see and good for mixed level of divers"
"Visibility over 15 meters. Very little current, sea life included: 2 green turtles, 2 white tipped sharks, one Marble Ray, a bull sea lion and a Mola Mola (sunfish). The topography was a rocky ledge. " "Visibility 60-80 ft. Moderate currents. Saw several dolphins and more sharks." "The only wreck dive in Galapagos and Kicker Rock is an explosion of color." "Drop down to only 60 feet and lay back on ledge to see schools of hammerhead sharks, schools of manta rays (Cow and Spotted) and sea horses; awesome!!! " "All types of sharks, small stuff too and if you are lucky, you may see a penguin." "White tip sharks, Black tip sharks, Galapagos Sharks, Reef Sharks (Tintoreras), heaps of tropical fish, gigantic sea turtles, rays and sea lions that are very friendly and playful!!!" "Another excellent site, I saw manta rays for the first time...quality!" You can base yourself on a Galapagos island, or - for Wolf and Darwin islands - dive from a liveaboard. "A first class operation and one of two operators who have permits for land and dive excursions"
MY Nortada hosts just 8 divers. See hammerheads, manta rays, whale sharks. Galapagos Master was built in 2004 and rebuilt in 2014 by Worldwide Dive and Sail team of yacht builders. 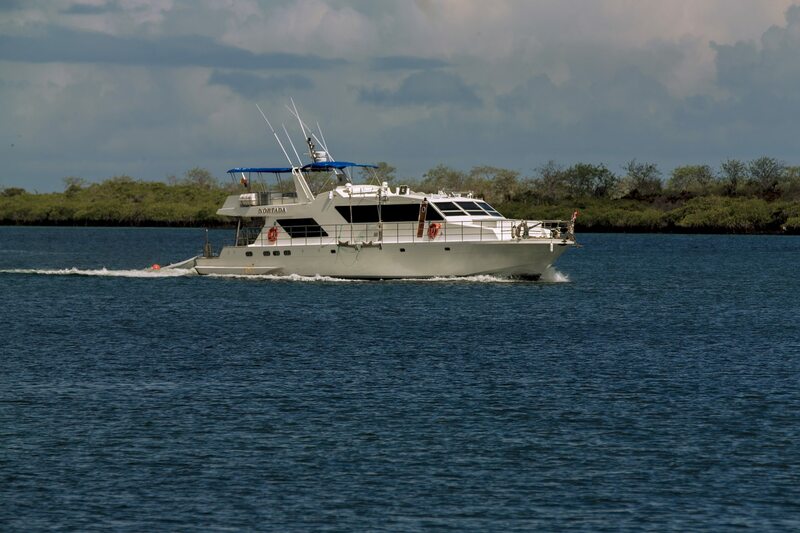 It is the most eco-friendly liveaboard in the Galapagos. 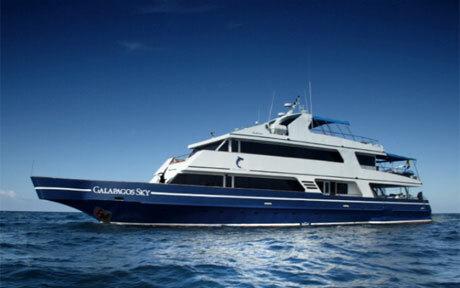 The Galapagos Master liveaboard is good for divers who enjoy underwater photography. The boat has special areas for working with photos and safe camera equipment storage facilities. There are also numerous charging points for your camera. She sails with up to 16 passengers for seven or ten nights. Galapagos Sky can accommodate 16 divers. "Come and explore The Galapagos Islands with Academy Bay Diving. Learn to Scuba, take our advanced divers packages, Live aboard for 8 days, or explore the islands above water. One of our favorite dive sites at the moment is Pinzon & Isla sin Nombre. It is a relatively unknown dive site, but rich in diversity. There are playful sealions, many turtles, schools of Galapagos Sharks, huge Manta Rays, red lipped bat fish and an aquarium of fish. All of it is possible if you let us handle your dream holiday details at Academy Bay Diving. " Basic accommodation starts at about $15 a night, it is well worth the money"
"Our unique Galapagos land based diving programs offer something so much more than just a cruise or live-aboard. Red Mangrove Galapagos Lodges is proud to offer island hopping, land-based diving adventure programs. You will have the opportunity to dive 2, 3 or all 4 islands depending on the packages and experience all that Galapagos has to offer on land and underwater. 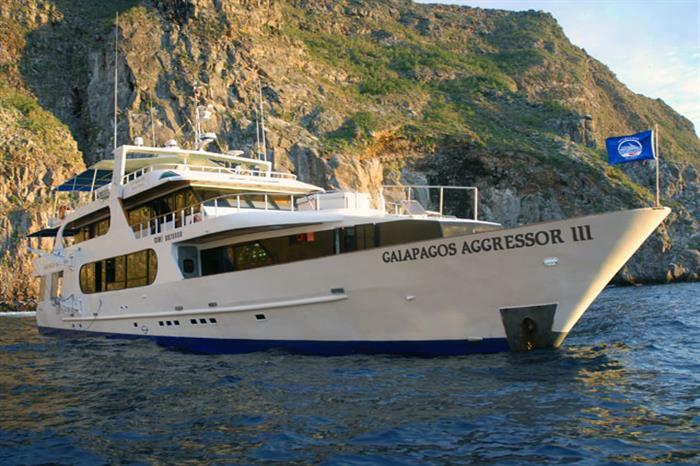 Land based diving programs in the Galapagos are the alternative to a live-aboard. Red Mangrove Galapagos Lodges offers 4 lodges on 4 islands we are the only brand with multiple lodges on multiple islands in the Galapagos, our lodges are of the highest standards of service and quality. Our Isabela Lodge and Aventura Lodge are ranked 1st of all hotels in the Galapagos at Tripadviser.com and are among the top 8 of all hotels in Ecuador, the Casa Iguana Mar y Sol on San Cristobal is rated 1st Bed and Breakfast in San Cristobal and our Floreana Lodge is rated the 1st specialty lodging in Floreana. Red Mangrove Galapagos Lodges has and is investing heavily in new diving equipment and safety equipment for the exclusive use of our clients. From our rooms to our food to our environmental practices, we strive to be the best we can possibly be. We are passionate about helping people to have a fun, meaningful and memorable travel experience. Our website Red Mangrove Galapagos Lodges shows you where, when and how. I look forward to hearing from you soon! " "I went with a scuba diving cruise, Galasam were reasonable, dive again definitely!" "Galapagos Tip Top Dive and Training facility is a PADI 5 Star National Geographic Instructor Development Dive Resort in the Galapagos Islands and the premier dive training facility in Ecuador. We offer courses from Open Water to Instructor including to Trimix and Rebreathers, all gases and full rebreather and technical diving support." "Nautilus has operated since 1989, Great Yacht, Great Dives, Low prices." Please send us your comments on the Galapagos or Ecuador. Do you want to add your dive shop or recommend a dive operator? Let us know.